Just when you thought John Kerry’s relevance carried as much weight as a feather, along comes a late-night TV appearance that blows it away. 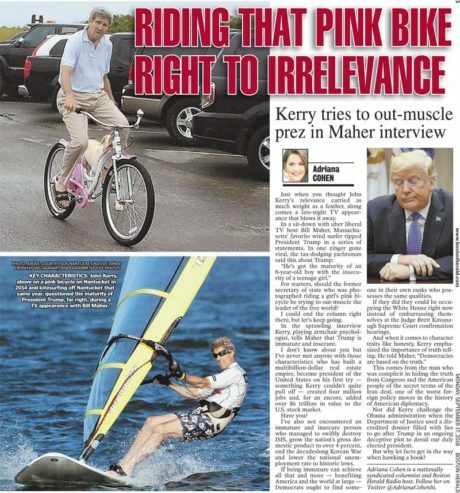 For starters, should the former secretary of state who was photographed riding a girl’s pink bicycle be trying to out-muscle the leader of the free world? I could end the column right there, but let’s keep going. In the sprawling interview ­Kerry, playing armchair psychologist, tells Maher that Trump is immature and insecure. I don’t know about you but I’ve never met anyone with those characteristics who has built a multibillion-dollar real estate empire, become president of the United States on his first try — something Kerry couldn’t quite pull off — created four million jobs and, for an encore, added over $6 trillion in value to the U.S. stock market. I’ve also not encountered an immature and insecure person who managed to swiftly destroy ISIS, grow the nation’s gross domestic product to over 4 percent, end the decadeslong Korean War and lower the national unemployment rate to historic lows. If being immature can achieve all that and more — benefiting America and the world at large — Democrats ought to find someone in their own ranks who possesses the same qualities. If they did they could be occupying the White House right now instead of embarrassing themselves at the Judge Brett Kavanaugh Supreme Court confirmation hearings. This comes from the man who was complicit in hiding the truth from Congress and the American people of the secret terms of the Iran deal, one of the worst foreign policy moves in the history of American diplomacy. Nor did Kerry challenge the Obama administration when the Department of Justice used a discredited dossier filled with lies to go after Trump in an ongoing deceptive plot to derail our duly elected president. But why let facts get in the way when hawking a book?